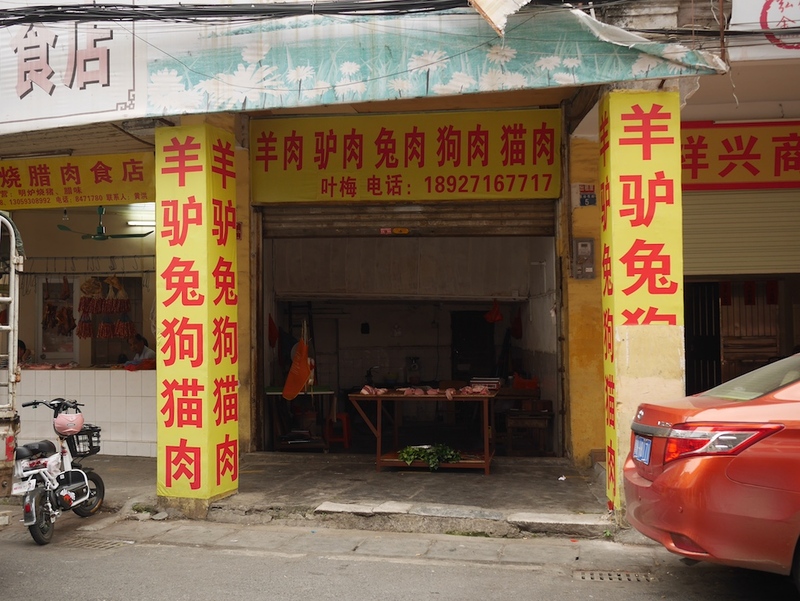 A variety of shops line historic Jiefang Road in Yunfu, Guangdong province. One which especially caught my eye sells meat. It was specifically the selection of meat available listed on its signs that I found notable. I have seen all of these types of meat sold and on restaurant menus in China before, but seeing them all together listed so prominently isn't a daily event for me. The first meat listed is identified with the Chinese character 羊 (yáng), which can refer to sheep or goats (and some other animals as well). Given how I have found the term used in many parts of Guangdong province, including in Jieyang, I presume it refers to goat. Donkey meat is next, which I saw on the menu at a restaurant in Huizhou — another city in Guangdong province. Then comes rabbit meat, which I most strongly associate with Zigong in Sichuan province since it is especially popular there. A couple of relevant dishes I had in Zigong appear in a post where I offer spicy evidence that family-sized portions of rice are quite common in parts of China. Next up is dog meat. I have seen this for sale in many regions. A post including photos of seven restaurants in Mudanjiang, Heilongjiang province, that feature dog meat comes to mind. The last item listed, cat meat, is the one I come across the least in China. I don't have any relevant posts about it. I have photos of various sightings though — potential material for a future post. While it significantly differs from what is available at typical grocery stores, I wouldn't consider this selection of meats especially exotic for Guangdong. In terms of what I have personally come across, the winner for that is probably a live animal market I visited a number of times in Shaoguan — more material for a future post. The bamboo rats did not look happy.